St James’s Market, situated in London’s Piccadilly Circus, comprises two mixed use buildings – the Haymarket and Regent Street Blocks – incorporating both luxury retail space and a total of 210,000 sq ft of office space. Our package involved the design, supply and installation of the full fit out of WC areas and carpentry and joinery works in both buildings. Haymarket WC fit out works incorporated drylined walls, SAS metal tiled and plasterboard ceilings, back painted glass wall linings, floor tiling, corian vanity units with integrated basins, all sanitaryware items and London Plane veneered cubicle fronts. The Regent Street WC fit out scope was similar to HMB but featured a fully glazed cubicle system, tiled WC duct walls and technical stone vanity tops. 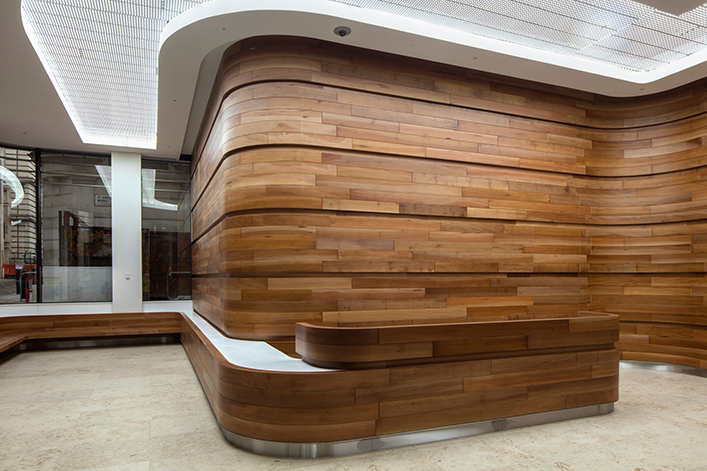 The carpentry and joinery scope involved curved London Plane veneered wall panelling to the Haymarket Reception area, a bespoke reception desk clad in London Plane veneer and corian, curved bench seating, a bespoke stone clad reception desk to the Regent Street block and doorsets and ironmongery throughout both buildings.